A team of students and faculty from the UW-Madison Urban and Regional Planning Department will release a report putting Mathew Desmond’s book “Evicted into a local context. 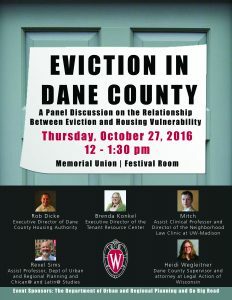 “Eviction in Dane County” looks at all the eviction case records available in Dane County from 2000 to the present (over 40,000 cases). The authors found communities of color to be disproportionately impacted. Please see page 3 of the attached report for a summary of the major findings.